From venue tours to cake tastings, take the WeddingWire app with you wherever you go. Access planning tools, vendors, inspiration and more in our wedding planning app. 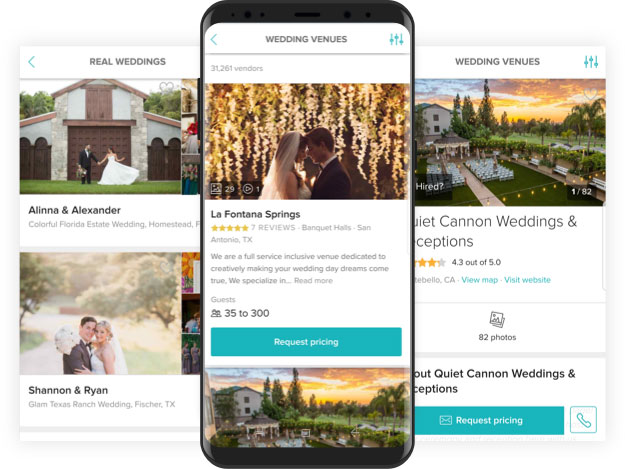 Manage all of your details on the go with the WeddingWire app. Check off to-dos and get reminders about upcoming tasks. Browse bridesmaid and wedding dresses to find your look. Search, contact and book your wedding vendor team. Discover the latest tips and ideas for your wedding from our experts. See how other couples in your area celebrated their big day. Ask questions and get advice in our community. Stay organized with the best wedding planning app out there.